The cult 1989 crime thriller starring Bruce Campbell and Sam Raimi coming to Blu-ray at the end of the year has now been fully detailed. 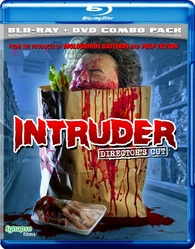 As previously reported, Synapse Films has revealed 'Intruder: Director's Cut' will be hitting Blu-ray on December 13. This slasher film that takes place inside a supermarket after closing time is directed by Scott Spiegel. The release will be a Blu-ray/DVD combo pack that features 2k digitally restored video, a DTS-HD Master Audio 2.0 soundtrack, and supplements will include: Commentary with writer/director Scott Spiegel and producer Lawrence Bender; Slashed Prices: The Making of Intruder featurette; Extended murder sequences from the original workprint; Outtakes from Spiegel's lost short film, Night Crew; Cast audition footage; Stills gallery; and Theatrical trailer. Suggested list price is $29.95. You can find the latest specs for 'Intruder: Director's Cut' linked from our Blu-ray Release Schedule, where it's indexed under December 13.